50+ spf sun cream for very high sun protection. Water resistant UVA & UVB. Unfragranced. 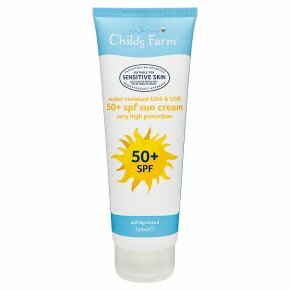 Childs Farm new formulation 50+SPF suncream for very high protection, is water resistant and protects young and sensitive skin from UVA and UVB rays, whilst keeping skin moisturised and hydrated. So you can relax while your children enjoy the sun safely. Suitable for babies and upwards. Dermatologist and paediatrician approved as suitable for sensitive skin and safe for people who may be prone to eczema. Childs Farm 50+ spf sun cream, unfragranced 125ml is registered with the vegan society! Shake well before use. Apply generously before sun exposure. Rub in well. Wait for the sunscreen to be fully absorbed. Reapply frequently every 1-2 hours, and always after perspiring, swimming or towelling. A reduced quantity will lower the level of protection significantly. Avoid intense midday sun. Over exposure to the sun is a serious health threat. Keep babies and young children out of direct sunlight and make sure they wear protective clothing and high SPF sunscreens (higher than SPF 25). Do not stay too long in the sun, even when using a sunscreen product. Sunburn damages the skin permanently and should be avoided. Even sunscreens with high sun protection factors do not provide 100% protection from UV radiation. Although this product has been tested, consumer's individual reactions to the product cannot be excluded. Avoid contact with eyes, rinse well with clean water if this occurs. Avoid contact with clothing, fabrics and surfaces. Permanent staining or material changes are possible even after the product has fully absorbed. Always patch test. We recommend that you carry out a patch test 24 hours before using any product for the first time. Avoid intensive midday sun. Over exposure to the sun is a serious health threat. Keep babies and young children out of direct sunlight and make sure they wear protective clothing and high SPF sunscreens (higher than SPF 25). Do not stay too long in the sun, even when using a sunscreen product. Sunburn damages the skin permanently and should be avoided. Even sunscreens with high sun protection factors do not provide 100% protection from UV radiation. Although this product has been tested, consumer's individual reactions to the product cannot be excluded. Avoid contact with eyes, rinse well with clean water if this occurs. Avoid contact with clothing, fabrics and surfaces. Permanent staining or material changes are possible even after the product is fully absorbed<br>Always patch test. We recommend that you carry out a patch test 24 hours before using any product for the first time.